Our filtration solutions feature high quality construction in metal or polypropylene and meet numerous international standards. We offer a variety of ducted and ductless fume hoods, storage solutions, and ceiling mounted filtration units. Creative uses for our ductless fume hoods, ductless workstations, filtration products, and custom enclosures. 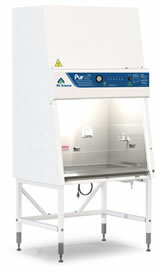 Air Science offers a range of fume hoods that can accommodate the needs of nano breweries, large-scale brewing companies, and everyone in between. Protect Your Cannabis or Botanical Production Process from Contamination.